This guide provides the link to the website allowing you to print from your own device, as well as provides you with step-by-step instructions for doing so. 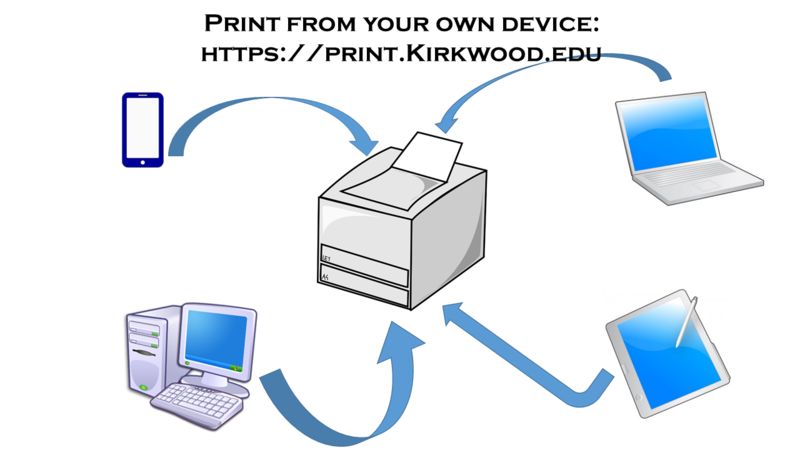 For printing from the Cedar Rapids campus library use printer BH_152BYOD_8300. For printing from the Iowa City campus library use printer ICCR_107_8400. If your document is not printing, make sure that it is closed. Print From Your Own Device will not print open documents. If not all the pages of your document are printing, click on the "Advanced" box and and manually input the pages that did not print. Only the following document types/formats can be used with the Everyone Print service: Microsoft Office (.docx, .xlxs, .pptx, etc. ), PDF, JPG, GIF, PNG, TIF, BMP & TXT. Webpages CAN be printed by selecting "Web Print" from the top menu and entering the address in the "Web Address to Print" search bar. After selecting your file, you will have to click on the button to "select a printer" once the file has been uploaded (this can take a while depending on the size of the document). (print hack: if you have an option, select to download as PDF). Your printing/copying account will be charged when using the Everyone Prints service.